We left for our Niagara Falls adventure early in the morning, heading north out of Portersville on I-79. We made it to Erie, then headed east along the shore of Lake Erie. It was my first view of any of the Great Lakes, and I think I'm hooked! I hope to plan more trips to this part of the country in the years to come. In fact, I believe that there are so many things to see in America, that it's almost unpatriotic to stay home and not go see it! Utilizing networks like Couch Surfing, it doesn't necessarily have to be incredibly expensive. We got off of the Interstate onto Highway 5, which is the Seaway Trail National Scenic Byway which stretches along the southern shore of both Lake Erie and Lake Ontario. 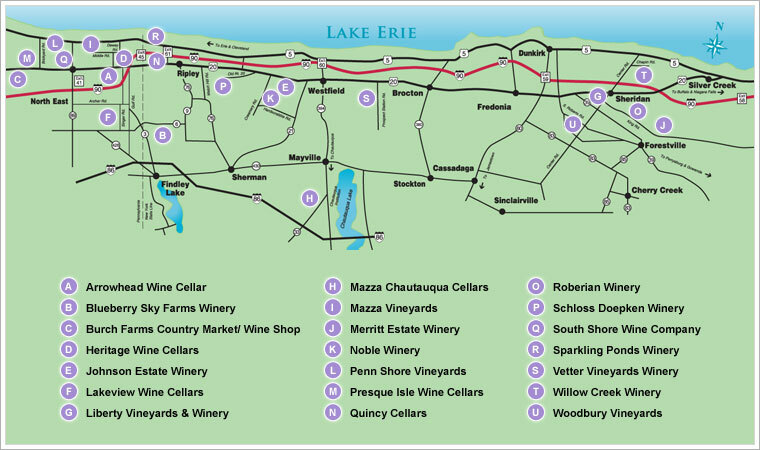 This part of the country is also home to the Chatauqua-Lake Erie Wine Trail. 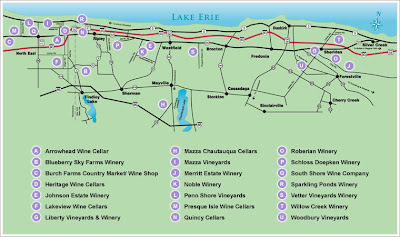 The wine trail stretches 45 miles through 30,000 acres of verdant vineyards along Lake Erie in western New York and Pennsylvania. Welcome to "America's Grape Country," the largest grape-growing region east of the Rockies. Visit more than 20 wineries known for their award-winning wines, including vinifera, ice wines, fruit wines, and specialty wines such as brandies and ports. Our wineries are open year-round. Plan your trip and experience the rich heritage of one of America's oldest grape growing regions. We only made the time to stop at one winery, the Willow Creek Winery. Honestly, we have got to come back this way just to hit the entire wine trail and stop at EVERY winery! The tasting was incredible, and we picked up nine bottles to take with us! We had been under orders from the Moms to pick up Willow Creek's chocolate wine, and, if you like sweeter wines, you'll love it. It tastes like a cherry cordial. Now it was time to head on down the road to Buffalo. Here is a view of the Buffalo skyline. By this time we were getting hungry, and needed something to soak up the wine tasting. 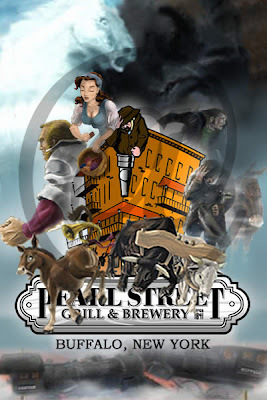 We had asked for a recommendation, and the young lady at Willow Creek recommended the Pearl Street Grill and Brewery in Buffalo. What a great recommendation! Great beer and great food. Unfortunately, they don't bottle, so the only way to take it with us would have been in a growler, and that would have been impractical for us. Our building was born in the year of Our Lord 1841 in the heart of what the world unaffectionately called "The most evil square mile in America", the Buffalo Erie Canal District. It is no "sretching the blanket", during its heyday it was estimated that 70 to 80% of the major crimes of the entire nation occured along the "Canawl". Out of the maelstrom of the teeming masses of Foofoos, Lakers, Canawlers Blacklegs, Macaronis, Whitelegsm Scalpers, Scoopers, Roughnecks and Runners our nation was reborn. The Babel-like confusion of Canal Street and the Commercial Slip was the Western terminus of the new America on the march, the brave new world, the H9ope of the unanointed and the downtrodden. The result of this amazing period of Buffalo's history was that we were the "Silicon Valley" of America for over 50 years. We are proud of our History and the hard-edge character of our building; our restoration has tried to maintain the "feeling". 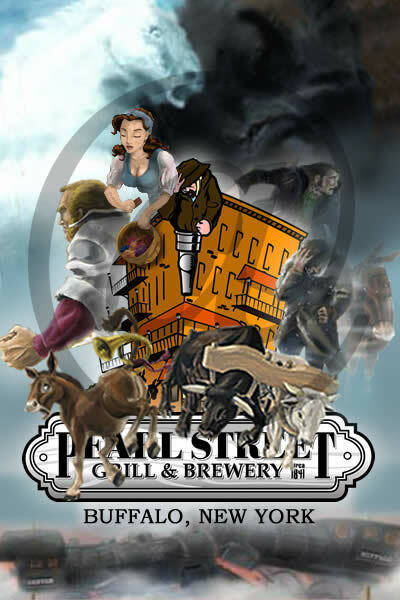 Unfortunately, there isn't a lot of detail of the history of either the building, the brewery or Buffalo area. Just enough to whet the appetite, I'm afraid. Hmmm... we might have to go back. The kind waiter gave us great directions, which basically entailed getting on I-190 north, which wasn't too difficult from the Grill. The roadway passes over two bridges that span the Niagara River, and a toll of $1 per car is collected at the first bridge (on the return trip, too). It's important to be in the far right land crossing the second bridge, because IMMEDIATELY on the north end, you have to exit on the Robert Moses Parkway that takes you to the American side of the falls. We parked at the American side and stopped for a view at the overlook at American Falls. You hear a lot about Niagara Falls, and I have to agree - go see the falls if at all possible! It is simply spectacular! This is a view up the Niagara River from the American Falls. It cost $10 to park on the American side, then we walked across the Rainbow Bridge to the Canadian side. Remember to bring your passports! The view from the Rainbow Bridge is incredible, looking toward the falls. Early in the day, it was beautiful and sunshiny, but the closer we got to Buffalo and Niagara, the more overcast and chilly it became, so our pictures leave a little to be desired. Even in mid November, the sunken gardens on the Canadian side are beautiful. However, this time of year a lot of the activities and amenities are closed, including the people mover that runs from the bridge to the falls overlook, so we hoofed it. Also closed (October 31, so we didn't miss it by too much) was the Maid of the Mist. But, if the only time you can go to Niagara is in November when a few things are closed, STILL GO! The falls are still falling and are incredible! Some of the best attractions are still open, including the Journey Behind the Falls. There are so many websites that help you plan your trip to Niagara, I'll just try to link a few here. This video is taken from the observation deck near the gift shop. Note, you might want to turn the sound down on your computer before you click on these videos. The roar of the falls is one of the attractions, but on a cell phone video camera, it just gets to be annoying! As you head down to the "Behind the Falls", they'll stop you to take your photo, which will be available at the end of the trip below. Ours turned out pretty good, but at $20 a pop, we decided to pass. After an elevator ride down, you put on the disposable plastic rain slicker and head down the tunnels. Note, It is really, REALLY wet down here! If you use your cameras or video equipment, be careful and use it only for a short time, otherwise it's going to get ruined. A little further on are two more tunnels that open up directly behind the falls. Down the tunnels are interpretive panels that tell you facts and figures about the falls. Before they did some engineering to the river, the falls were receeding at a rate of about three feet a year. One of the tunnels that had been built earlier is now exposed on the rock face. Now it's time to make our way back up above the falls, walk back to the bridge and cross back over to the pickup. Passing the commercial district of the Canadian side, it's easy to see that not all of the development around the falls enhance the natural beauty! There you have it, our visit to Niagara Falls. Please make plans to visit yourself... soon!